Computer Science and Engineering is a discipline that integrates several fields of Engineering and Technology. Computer Engineers are involved in many hardware and software aspects of computing, from the design of individual microprocessors, personal computers, and supercomputers, to circuit design. This field of engineering not only focuses on how computer systems themselves work, but also how they integrate into the larger picture. 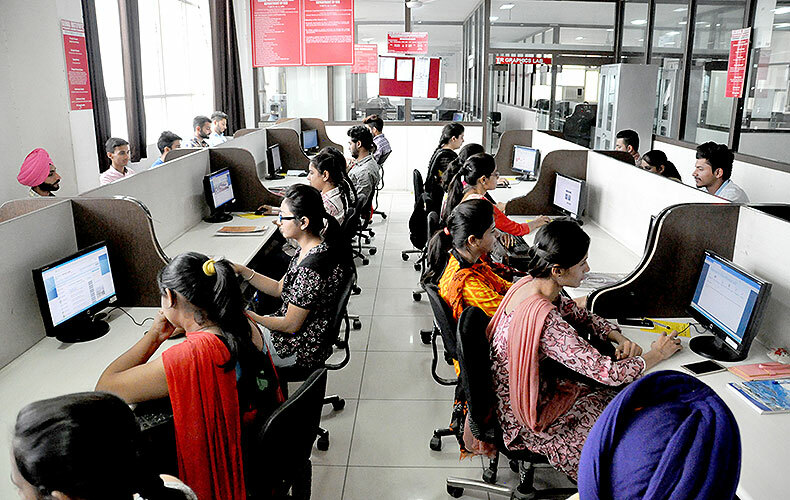 Department of Computer Science & Engineering was started in 2008 and it has grown into a vibrant centre of teaching and research. 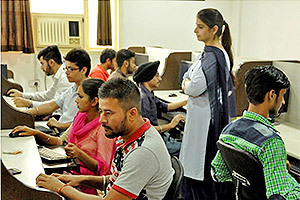 The Department not only runs Under Graduate and Post Graduate Programmes of studies in Computer Science and Engineering but also has started high quality research and Job Oriented Programmes like Oracle, Java, CISCO, DB2 (IBM) and SAP etc. To evolve into a centre of excellence in computer science through leading edge education, research, innovation and services, which will in turn contribute towards solving complex societal problems and thus building a peaceful and prosperous mankind. 1. Creating an excellent learning environment to foster globally competent Computer Science Engineers. 2. Imparting quality engineering knowledge by experienced and dedicated faculty, synergized with Industrial interactions and R & D activities. 3. 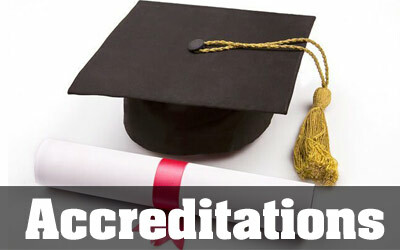 Providing a vibrant environment to facilitate students’ professional and personal skills and values. Graduates shall have strong practical and theoretical expertise in Computer Science and allied engineering, in mathematics and science and shall opt for employability or higher studies or research or entrepreneurship, either in India or abroad. Graduates shall have global outlook, technological leadership, creative thinking towards innovation and enterprise to contribute to society. 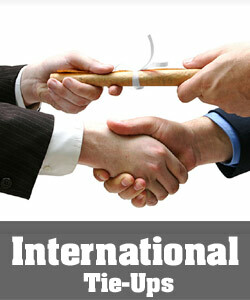 Graduates shall have excellent teamwork, communication, interpersonal skills, high morals and ethical values. An ability to design a system, component ,or process to meet desired need within realistic constraints such as economic, environmental, social, political, ethical, health and safety, manufacture ability, and sustainability. The broad education necessary to understand the impact of engineering solutions in a global,economic, environmental, and societal context. A knowledge and understanding of the management and finance concepts to estimate and manage projects in multidisciplinary environments. Computer Science and Engineering students are exposed to basic Engineering Concepts during first year course such as Engineering Mathematics, Physics and Chemistry, and Engineering drawing. 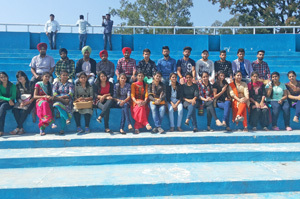 From Second Year they are exposed to Core Computer Science Subjects like Programming, Data Structures, Digital Logic, Theoretical Computer Science, Algorithms, Computer Networks, Operating Systems, Web Technologies, Databases and Computer Architecture are few to mention. Department of Computer Science and Engineering organized Project Exhibition of final year students on 22nd May, 2017. Dr. R.C. 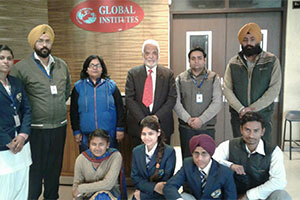 Gangwar, Professor, BCET Gurdaspur was the Chief Guest for the event. 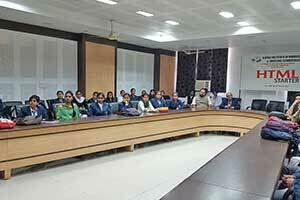 While evaluating the projects, the learned scholar gave suggestions regarding future prospects of their projects. 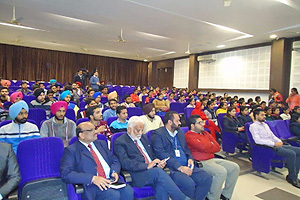 The students exhibited keen sense of competition in the execution of their projects. 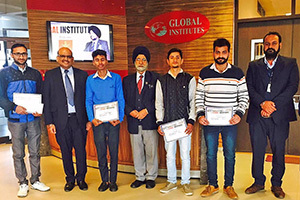 Dr. Sandeep Singh Kang (HOD,CSE) appreciated the students for their tremendous efforts and show of skill and motivated them to use their projects on the commercial level. Department of Computer Science & Engineering Organized two days trip to Mcleodganj on 01.04.2017 & 02.04.2017 for B.Tech CSE final year students. 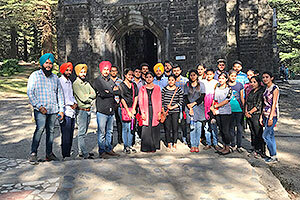 The students have explored many places like Bhagsunag waterfall, Mcleodganj market, Naddi and paid obeisance at Dalailama Temple and an old Christ Church. Students had also trekked to a water stream nearby Naddi on the 2nd day of trip. Overall students had a joyful and memorable stay at Mcleodganj. CSI Student Chapter of Department of Computer Science & Engineering Conducted One Week Workshop HTML Starter exclusively for its student-member from March 06-10, 2017. The objective of the workshop was to introduce HTML to those student-members, who were unfamiliar with basic HTML. 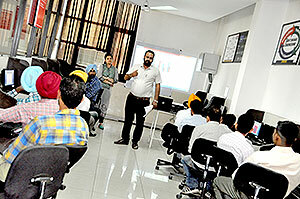 The workshop covered important topics for webpage creation like tables, images, hyperlink and forms etc. 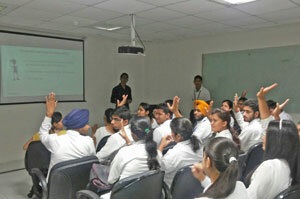 The students listened and carried out exercises very enthusiastically and were very interactive with the trainers. 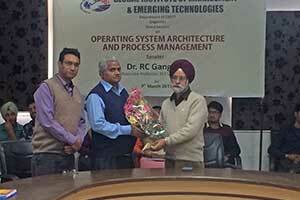 Department of Computer Science and Engineering Organized a Guest Lecture on “Operating System Architecture and Process Management” on 7th March 2017. 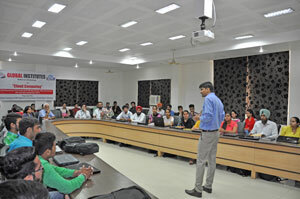 Dr. R C Gangwar, Associate Professor, Department of Computer Science & Engineering, Beant College of Engineering & Technology, Gurdaspur delivered a talk on “Operating System Architecture and Process Management” to B.Tech students. In his well documented lecture, Dr. Gangwar discussed about Operating System and its evolution, Architecture of Operating System, and Process Management. Technovation Club of Department of Computer Science & Engineering/ Information Technology Organized Group Discussion Competition on 01.03.2017. The objective of the competition was to improve or expand one’s knowledge of things, to improve their confidence level and to prepare them for the interviews. 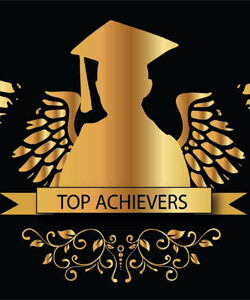 The students from different streams of B.Tech, MBA, MCA, B.Sc. (Agri) participated. The Department of Computer Science & Engineering Organized Global C++ Geek: Programming Competition on 13.02.2017. The objective of the competition was to to enthuse students in depth technical aspects of basic C++ Programming. The competition was organized and managed by the faculty and student coordinators of the CSI branch. 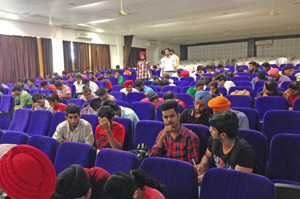 72 Students of different streams participated in the Competition. 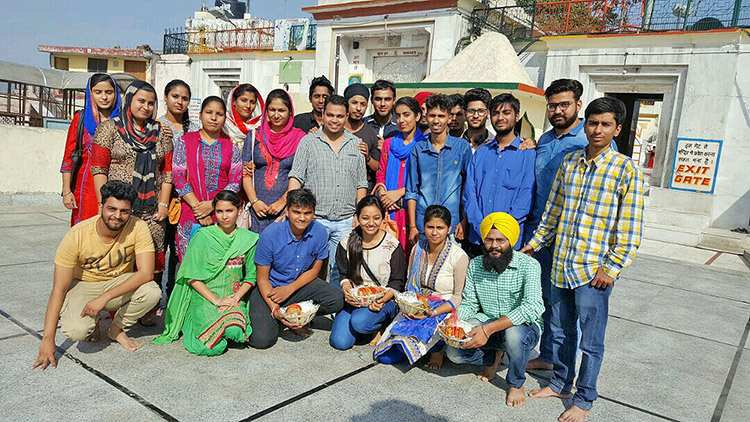 Department of Computer Science & Engineering Organized one day trip to Sri Anandpur Sahib on 10.02.2017 (Friday) for B.Tech CSE 2nd year students. 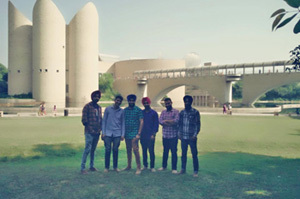 The purpose of the trip was to let the students know about the rich heritage of the Khalsa Panth. 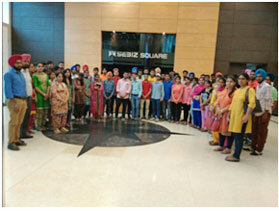 The students paid obeisance at Takht Sri Kesgarh Sahib and also visited the heritage museum Virasat-e-Khalsa. The museum celebrates 500 years of the Sikh history and the 300th anniversary of the birth of Khalsa. Technovation Club of Department of Computer Science & Engineering/ Information Technology organized Quiz Competition on 31.01.2017 under the supervision of the HOD (CSE) Dr. Sandeep Singh Kang. The competition was organized and managed by the faculty and student coordinators of the Club. Departments of Computer Science and Engineering/ Information Technology organized a Guest Lecture on “Issues in Software Engineering” on 24th Jan 2017. 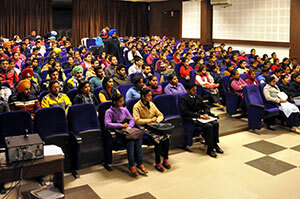 Dr. Hardeep Singh, Professor, Department of Computer Science & Engineering, Guru Nanak Dev University, Amritsar delivered a talk on “Issues in Software Engineering” to B.Tech (CSE) and B.Tech (IT) 3rd year students of the college. 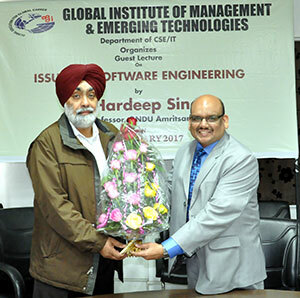 In his well documented lecture, Dr. Hardeep Singh discussed about Software Engineering, Software Crisis, Costs of Software Engineering, and Attributes of Good Software, Software Engineering Models, and various challenges facing Software Engineering. 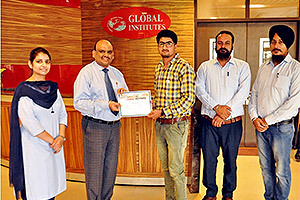 Department of Computer Science & Engineering of Global Institute of Management and Emerging Technologies held an exhibition of the software projects prepared by its students to showcase their quality work. In all 35 projects were exhibited, which were evaluated by a team of Computer experts headed by Dr. Harish Kundra and Dr. Sanjay Singla. The team members observed that all the projects were of great utility in daily life. They appreciated the students that they had worked hard on their projects and advised them that they should keep learning new skills as the computer science field is expanding everyday beyond imagination. 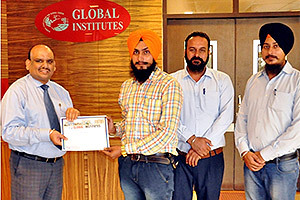 The experts selected Mr. Danish Sharma, Mr. Harkirat Singh and Mr. Karan Chopra’s project “E-Post” as the best. “E-Post” office system is the shopping of the world renowned on the intranet and an additional distribution channel. It sells stamps, post cards, cartoons and has services like couriers, registering for electric vendors, selling mobile cards etc. 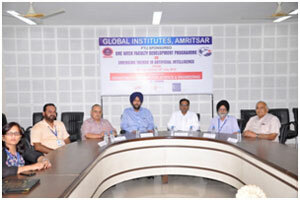 The Department of Computer Science & Engineering of Global Institute of Management & Emerging Technologies, Amritsar organized a 1 – week Faculty Development Programme on “Cloud Computing” in collaboration with NITTTR, Chandigarh. This was a cluster umbrella programme in which 31 colleges from all over India participated in this educational venture conducted through ICT. 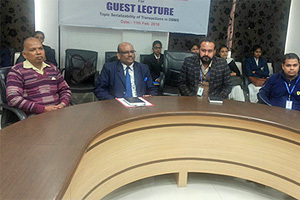 Dr. C. Rama Krishna, Professor and Head, NITTTR, Chandigarh and Er. Mala Kalra coordinated the various sessions. 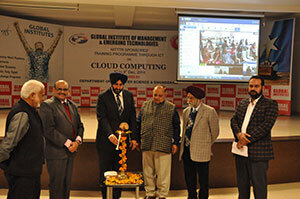 In all, 13 special expert talks on different important aspects of Cloud Computing took place. 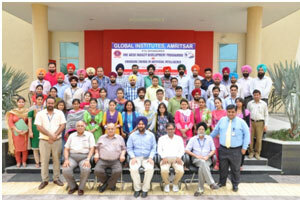 Fifty three (53) teachers attended the FDP at Global Institute of Management & Emerging Technologies, Amritsar, including 6 participants from other institutions. 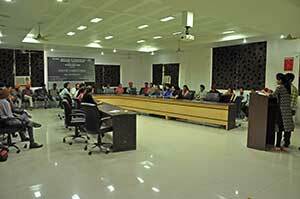 NITTTR had also invited subject experts from well- known MNCs like Infosys and IBM for interaction with the faculty. The FDP proved to be very useful for the teachers. Also, the experts not only dealt with certain areas from their course of study but also discussed various research issues in the field. The Technovation Club of Department of Computer Science & Engineering / Information Technology Organized ‘Treasure Hunt’ event on 28.10.2016. The Objective was to build team spirit among students and to motivate them to use mind, body and strategy to solve puzzles successfully. 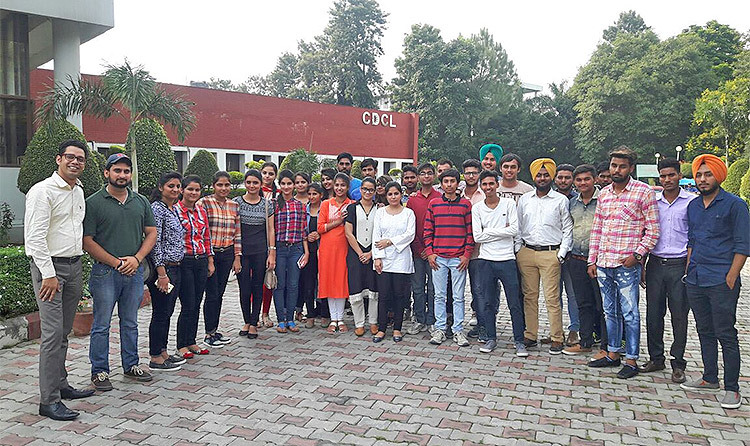 Department of CSE Organized one day religious trip to Naina Devi and Anandpur Sahib for 3rd Year students on 21-10-2016. 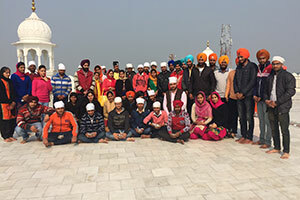 The objective of this trip was to provide sikh punjabi and other communities students to aware about the best of punjab (Viraste Khalsa), Gurdwara Yatra and other religion related holy places. Department of CSE/IT, in association with Career Launchers, organized a workshop on “Aptitude” on 18th October 2016. The expert speaker Mr. Firoz Talwar explained the importance of “Aptitude” in various job exams and interviews and also explained career opportunities in government sector jobs. He also taught smart techniques to solve quantitative problems and gave shortcut methods to solve comprehension exercises. One day Hands on workshop on “Unity Programming ” organized by department of CSE/IT on 14th October 2016 in association with Sach Tech Solutions, Mohali. Er.Jaspal Kumar expert explained the importance and carrier opportunities with application development an games development with Unity in today’s world. He explained the working and features of unity Simulator “UNITY”. The expert team has given good source of knowledge to students, and students took this opportunity as a challenge and designed games. 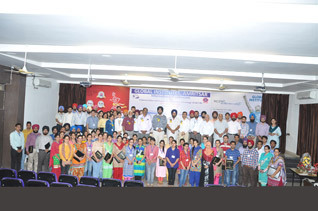 Two -day Hands on workshop on “Mobile Computing using Android” was organized by department of CSE/IT in association with VMM Education, Amritsar. Er. Parwinder Singh expert explained the importance and carrier opportunities with Android App development in today’s smart world. He explained the working and features of Android Simulator “ANDROID STUDIO” and also told working of sensors in Android. 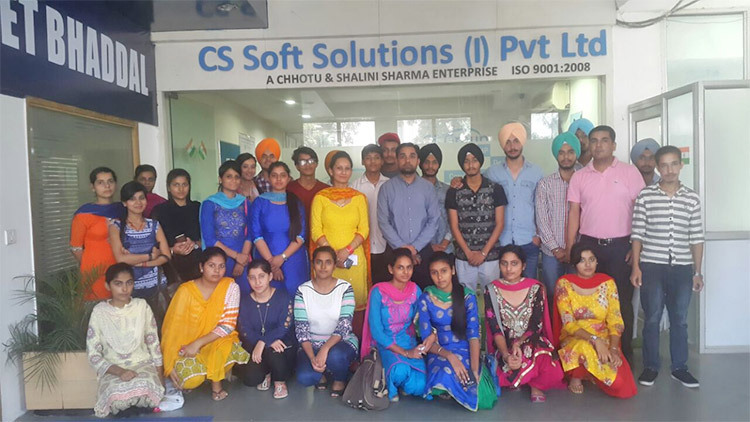 Department of CSE/IT Organized an Industrial visit on October 08, 2016 at CS Soft Solutions. 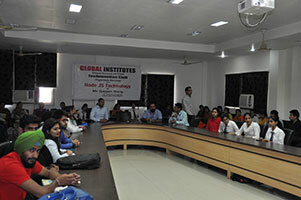 Mr Rohit Soni guided the students about Internship training and Job opportunities in Industry. He helped students to Bridge gap between classroom and real world. 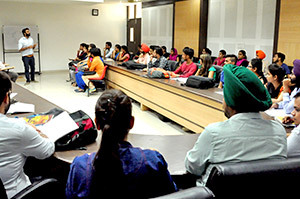 A Guest lecture on “Advance concepts of Computer Architecture” was organized by the department of Computer Science & Engineering for the students of B.Tech. CSE/IT. 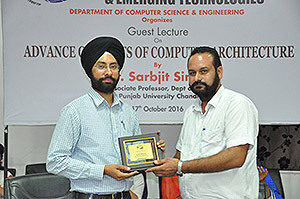 The resource person was Dr. Sarabjeet Singh, Associate Professor, Department of CSE, UIET, Panjab University, Chandigarh. He has Covered Pipelining and Parallel Processing, Vector Processors, Array Processors, Inter processor Communication and Synchronization. 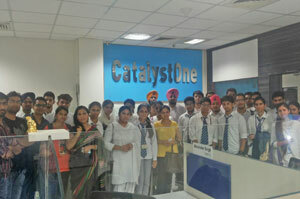 Department of CSE/IT Organized an Industrial Visit CLICK Labs, , Chandigarh for B-Tech students. 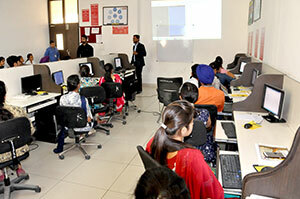 Mr Vinod guided the students about Internship training and Job opportunities in Click labs. 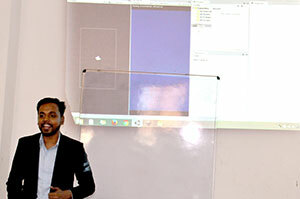 Mr Ram guided the students about PYTHON programming language . Technovation Club of Department of Computer Science & Engineering/ Information Technology organized a Debugging Contest on 28.09.2016 .The Objective of contest was to check technical and logical ability of students.. The students were given C++ code for debugging in specific time. 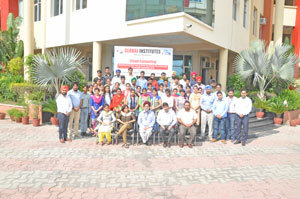 The students from all streams of B.Tech, participated in the event. Bibek BC of B.Tech CSE- 3rd sem scored first position . 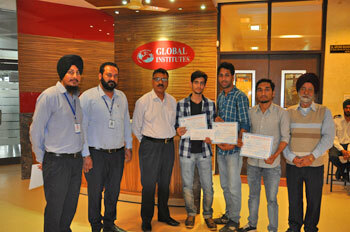 Satnam Singh and Shivam Mahajan of B.Tech CSE- 3rd sem scored 2nd and 3rd position. The winners were awarded with cash prizes and certificates by Director GIMET and HOD(CSE). Technovation Club of Department of Computer Science & Engineering/ Information Technology Organized Debate Competation on 12.08.2016 .The Objective of Competition was to Check Talent, Confidence, Knowledge and Communication Skills of Participants. The Department of Computer Science & Engineering Conducted One Week Skill Development Program on “Advance Contents of MICROSOFT WORD and EXCEL” for Non- teaching Staff from 25/04/2016 to 29/04/2016. 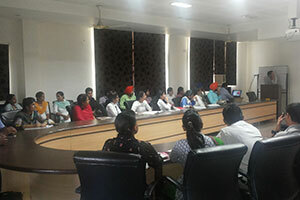 The Objective of this training Program was to develop confidence among Participants in using computer and to carry out day to day office work through using MS Office. Quiz competition “ TECHNO-QUIZ” was organized by “ELECTROCRATES CLUB” in the Department of Electronics and Communication Engineering under the coordination of A.P Ravi Parkash and A.P. Shamsher Singh. 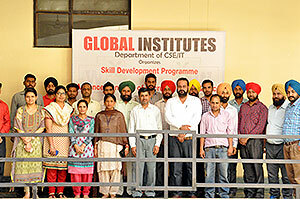 Different teams from various classes of ECE Department participated in the event. 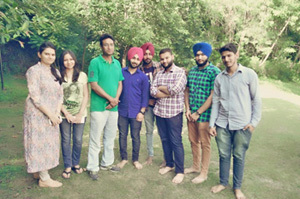 Out of which students of 4th semester (Section-E3) Tarandeep Kaur , Sukhbir Singh, Manpreet Kaur and Munish Kumar were declared as the winners, where as Gurinderjit Singh, Karanjit singh Gill , Jobanpreet Kaur & Karanvir Singh from 8th semester (Section-E7) were declared as second. 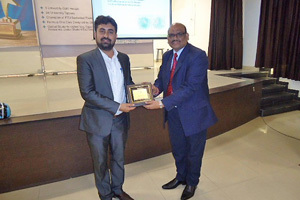 Department of Computer Science and Engineering Organized Guest Lecture on Transaction Processing in Database Management Systems on 11th Feb 2016 . 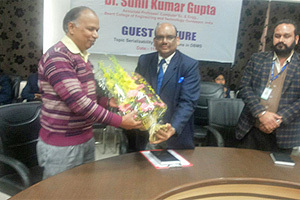 The Speaker of the Lecture was Eminent Personality and Database Expert Dr. Sunil Kumar Gupta Associate Professor, BCET Gurdaspur. Dr. Gupta very well explained the principles of transaction management, Concurrency Control, Serialization and read and write controls for transaction Processing. Technovation Club of Department of Computer Science & Engineering/ Information Technology Organized Group Discussion Competititon’ on 4.02.2016. 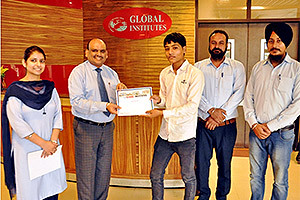 Akil Bashir of B.Tech (Civil), Mahir Bansal of (HMCT) and Rashmeen Kaur of B.Tech (IT) got first, second and third positions respectively. 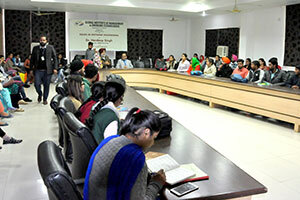 Technovation Club of Department of Computer Science & Engineering/ Information Technology Organized Group Discussion ‘ on 4.02.2016 under the supervision of HOD (CSE) Dr. Sandeep Singh Kang. 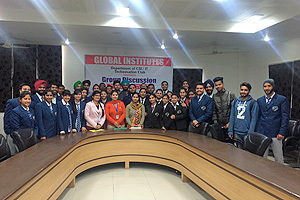 The Objective of the Event was to create Confidence and awareness of general topics among students. The competition was organized and managed by the faculty and student coordinators of the Club. There were 2 rounds in this competition. Round 1 was the elimination round in which 8 teams (5 students in each) from different streams of B.Tech, (CSE, ECE, IT, ME, Civil), Diploma, HMCT, ATHM, MCA and BCA had participated. Out of those 8 teams, 7 students were selected for the final round. 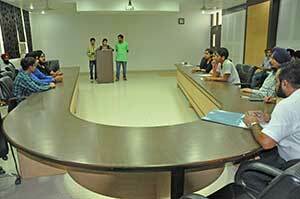 In each round participants were given topic on the spot.. Each team was given 6 minutes to speak on the topic given. 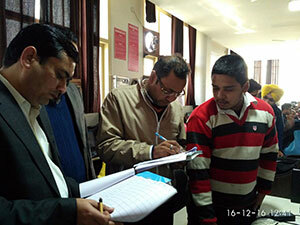 First, Second and Third Postions got by Akil Bashir B.Tech (Civil) ,Mahir Bansal (HMCT) and Rashmeen Kaur B.Tech (IT). 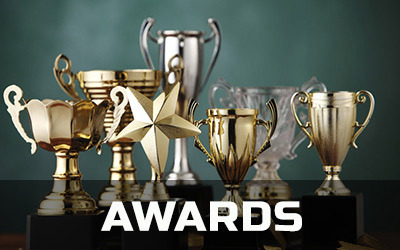 Cash prizes and Certificates were awarded to winners by Director ,GIMET. Department of Computer Science and Engineering Organized Workshop on MATLAB on 3rd Feb. 2016 .The Expert of Workshop was Er. Harjeet Singh Project Engineer, DRDO. Er. 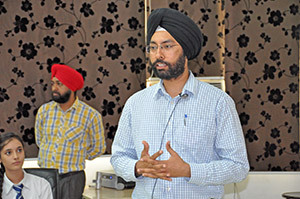 Harjeet Singh explained the advantages of MATLAB programming environment, use of Mathematical functions for solving linear algebra, statistics, Fourier analysis , various color models of 3-D images and to make applications with custom graphical interfaces of Matlab. attended. 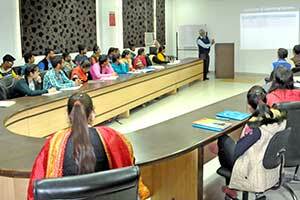 The workshop speaker was very animated, knowledgeable and imparted very useful introductory training to the students. The students also responded well and gained immensely. 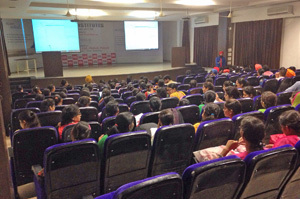 Technovation Club of Department of Computer Science & Engineering Organized Seminar on Node JS Technology on 26th Oct, 2015. 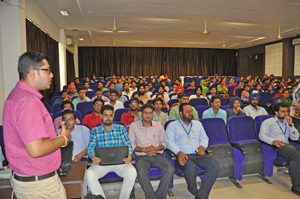 Mr Gagan Garg, Senior Software Engineer, CLICK Labs, Chandigarh explained the Process Overview of Web Development and Latest Web Technologies in IT industry. 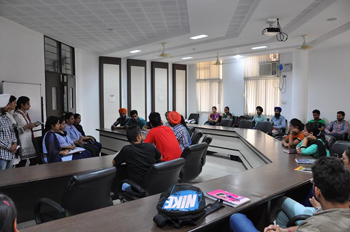 Department of Computer Science and Engineering Organized a Workshop on ANDROID MOBILE APPLICATION DEVELOPMENT on 14th Oct,2015. Mr. Anurag Byala M.D. 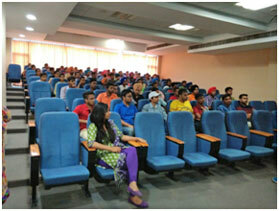 Techies Infotech , Chandigarh discussed about the latest technologies and also about Android Operating System. 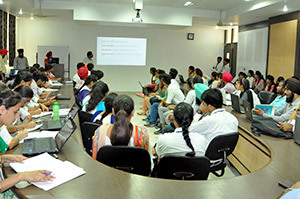 The department of Computer Science and Engineering organized One day Workshop on Matlab on 13th Oct,2015. 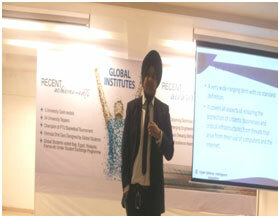 Mr. Jasjot Singh Dhaliwal , Project Manager, Solitaire Infosys Pvt. 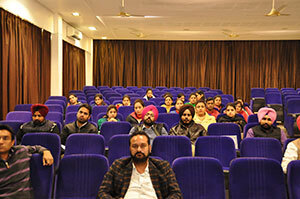 Ltd., Chandigarh disseminated useful information to the students. 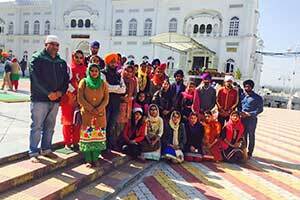 The department organized a trip to Anandpur Sahib and Virasat-e- Khalsa for B. Tech 3rd year students on 10th Oct 2015. 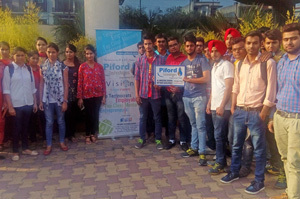 Technovation Club of Department of Computer Science & Engineering/ Information Technology Organized ‘Picto Competition’ on 10.09.2015 Participants were shown a sequence of pictures on a theme and they were asked to write a story based on the theme. 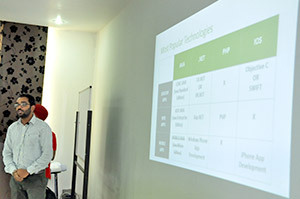 The Technovation Club of department of Computer Science & Engineering Organized an Expert lecture on the topic “Innovations in Research & Wireless Sensor Networks” on September 2nd, 2015. Prof. (Er.) 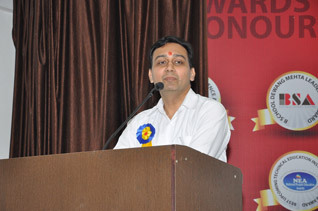 Anand Nayyar, Assistant Professor & Head- Academic Research, KCL Institute of Management & Technology, Jalandhar enlightened the students and the faculty about the latest technologies in the computer world and about the research methodologies. 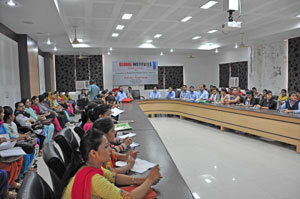 Department of Computer Science & Engineering organized PTU Sponsored One week Faculty Development Programme on “Emerging Trends in Artificial Intelligence”. The main focus of FDP was to explain knowledge representation, problem solving and learning methods of Artificial Intelligence and its applications. 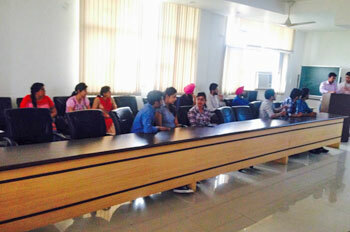 Department of CSE Organized an Industrial visit to SEBIZ Infotech, Mohali for B-Tech 2nd year students. The objective of the visit was to create awareness in students providing them an industry exposure and to guide them for their Industrial Training, Placements and various Career Opportunities in Software industries. International Conference on Communication, Information & Computing Technology (ICCICT-15). 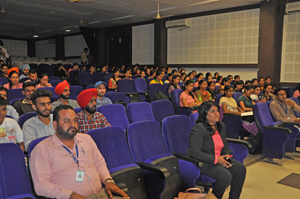 Technovation Club of department of Computer Science & Engineering has Organized ‘Quiz Competition’ on 1st April, 2015 under the supervision of the HOD (CSE) Dr. Sandeep Singh Kang. The competition was Organized and managed by the faculty and student coordinators of the Club. There were 3 rounds in this competition. Round 1 was the elimination round in which 61 teams (183 students- as there were 3 students in each team) from different streams of B.Tech, MCA and BCA had participated. There were multiple choice technical questions in this round. Out of the 61 teams, top 8 teams had qualified for round 2. It was a general quiz round. Out of 8 teams, top 4 teams had qualified for the final round, which was Rapid Fire round. In this round, the participants were asked five questions in a row. Team of Saif Rafiq(M6), Moied Guttoo(M6) and Biswash Paudel (E6) got 1st position, while the team of Rahul Kumar(M6), Kulpreet Singh(M6) and Vivek Sharma (M6) got second position. 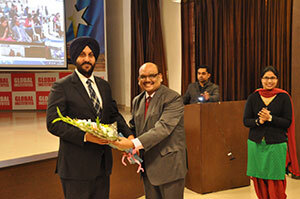 Mr. Samandeep Singh (Club Coordinator) and Ms. Ruby Singh (Club co-coordinator) had judged the competition. 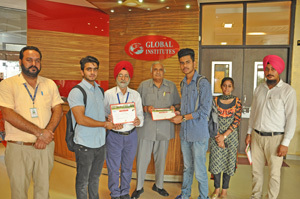 Winners were awarded with certificates and cash prizes by the Director Dr. Arvind Bhardwaj. 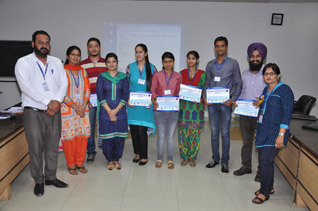 Technovation Club of Department of Computer Science & Engineering has Organized ‘Debugging Contest’ on 18.03.2015 under the Supervision of the HOD(CSE) Dr. Sandeep Singh Kang. Debugging Contest was the Competition for those who are skilled and Expert in Various Programming Languages. The Objective of Contest was to Check Expertise of Students in C++ Programming. Participants were given a buggy (Full of errors) Program . They had not to write the full code for the program. All they need to find errors and edit them in order to run it with valid output. One catch of this event was that they should not change the logic of the program. 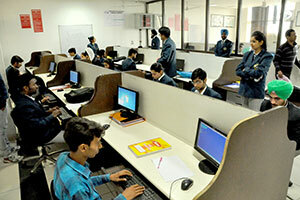 More than 50 Students from different streams of B.Tech, MCA and BCA have participated in the contest. 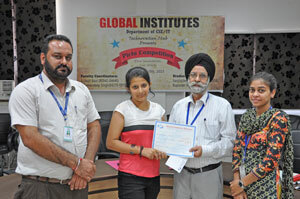 Simranjit Kaur of MCA 2nd Semester has bagged Ist position and Sandeep Kaur of 4th Semester has got the Second position. 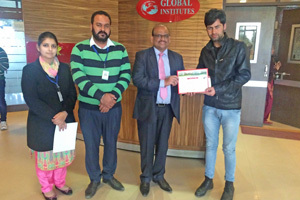 Winners were awarded with Certificates and Cash Prizes by Director Dr. Arvind Bhardwaj. 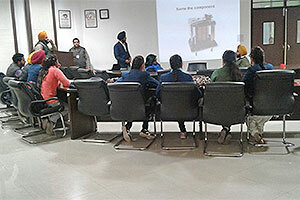 Industrial visit to Sebiz Infotech, Mohali on 12th Feb, 2015. 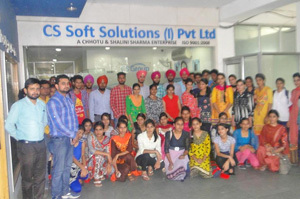 Department of CSE Organized an industrial visit on Thursday, February 12, 2015 at Sebiz Infotech, Mohali for B-Tech 3rd year students to familiarize students in terms of the technical details and Projects handled by the company on an important part of Recruitment ,Placement Policy and Various Career Opportunities in I.T. industries. Mr Sandeep Sharma, Business Development Manager, Sebiz Infotech delivered a seminar on internship training and placement opportunities. Ms Ankita from Sebiz infotech delivered a lecture about web development using PHP and Mr Kapil Sharma from Sebiz infotech took queries of students about JAVA. 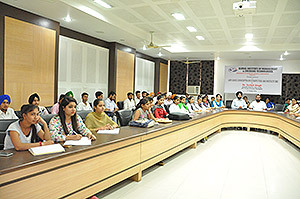 Overall the whole session was an educating and interactive one and was useful for students in all ways. 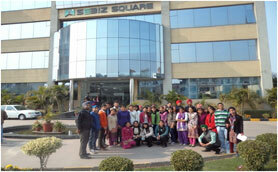 After that Students were familiarize with various Projects undergoing in Sebiz Infotech. 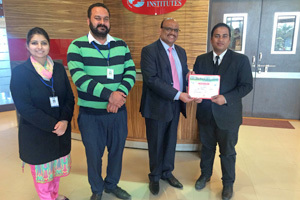 Department of Information Technology organized a guest lecture on 7th January 2015. 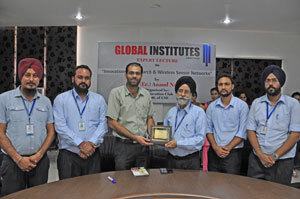 The lecture was delivered by Mr. L.S.Chabbra, Founder and Director of the Cyber Defence Consultancy(CDI). The objective of the lecture was to raise the awareness among the mass regarding cyber security and to provide the solution to the hacking. 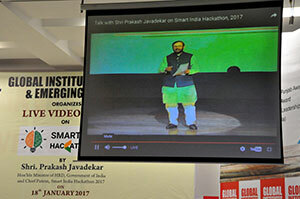 He gave various examples of hacking and also encouraged the students to work in the field of cyber security. 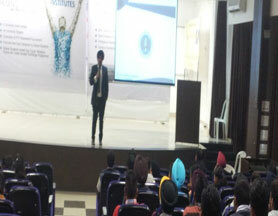 He also discussed the various job opportunities available in the field of cyber security.. The lecture was very timely and well appreciated by the audience. 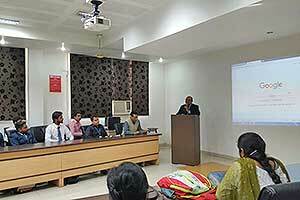 Mr. Vipin Gupta from U-Net Solutions Banglore conduct a one day workshop on “Virtualization and Cloud Computing” . The main aim of this workshop was to introduce the students with the concept of Cloud computing and how to use the application of cloud computing. In this workshop student practically implement the concept of cloud computing. 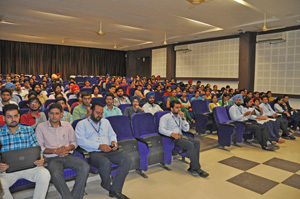 A two Days International Conference on “Emerging Dimensions in IT and its Applications in Industry” was organized by Department of CSE, IT and MCA on March 02-03, 2012. The aim of the Conference was to present, exchange and discuss the innovative and creative ideas and actual research results. 55 papers were selected for presentation during the Technical Sessions of the Conference after a dual review process by experts in the field. 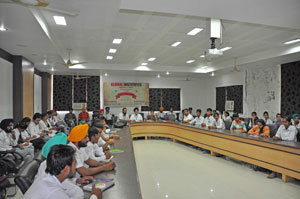 Four Technical Sessions were organized. 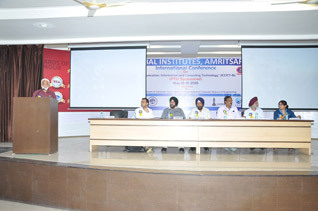 The highlights of the Conference were the stimulating and seminal addresses by the Chief Guest, Mr. M.L Gupta, Vice-President, IETE, New Delhi, Keynote Speaker Mr. Ravi Ramachandra Raju, Regional Head of Infosys Infrastructure Group, India, and Guest of Honors, Dr. Hardeep Singh, Professor, Guru Nanak Dev University, Amritsar. The Conference has been extremely beneficial to the students, application engineers and research scholars in terms of knowledge enrichment, development of spirit of innovation and research motivation. 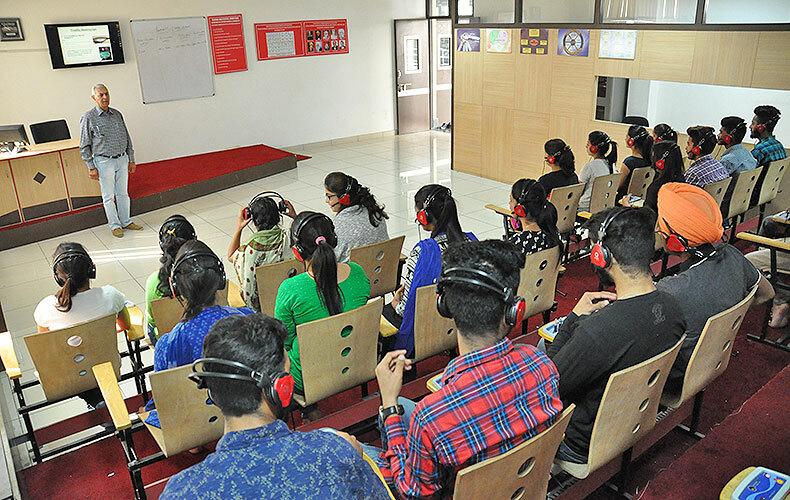 ORACLE provided training to our faculty members at Delhi Head Office and has started certification programme for the students in the college. It is the name of Inter Department Technical Competitions which provide a platform for the future engineers to exercise and prove their technical capabilities. The future engineers can build up their confidence because education is not only to provide the students with knowledge but also to prepare them for coming market challenges. Following events are organized regularly.